This is a personal blog for an Ecommerce course. The blog discusses personal interests such as volunteering, craft projects, and cake decorating. 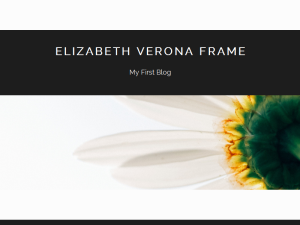 This what your Elizabeth Verona Frame Blog Ad will look like to visitors! Of course you will want to use keywords and ad targeting to get the most out of your ad campaign! So purchase an ad space today before there all gone! I am excited several peers have said they like my cakes and crafts! I enjoy doing these things, but honestly don’t have much extra time to devote to these funtivities at the moment…maybe after I finish my studies in December I can get out my sewing/embroidery machine and start monograming! I have really wanted to become proficient using this machine for some time now. However, in the meantime, I have to manage my time wisely and I believe in order to stay grounded, in addition to family, work and school, I must also be actively engaged in the community around me. I started volunteering as a very young kid and it has always been something that is very much important to me. I would love to take some time to share a bit about some of the organizations that are closest to me at this season of my life. I remember attending a Christmas party at the Home of the Innocents when I was a child. It was probably one of my first “volunteer” opportunity and really set the stage for “how to volunteer.” I was just a kid and a girls group that I was involved in had collected toys for the children that lived at the Home. It was my job to play with the other children and get to know them…it was that simple. I remember learning there were kids my age they lived all together in this big building. I remember learning that we bought them presents because many of them didn’t have moms, dads, grandmas, and papaws to buy them presents and that honestly that made me sad. I’m sure this experience, along with many others has given me the desire that I still have today to give back to the community. As I’ve shared, I moved to WV after college, but after coming back to KY, I decided to volunteer at the Home again. I am so excited to share that I just recently joined as a member of the Audit and Finance Committees of the Home. I feel that this will allow me to continue to have an impact, using the education and work experience I have. The Home provides children with a range of residential, treatment and community-based programs. Programs include offering a safe haven for at-risk children; pediatric medical care; shelter and education for pregnant and parenting teens; crisis and intervention services; clinical treatment services and therapeutic loving foster and adoption services. The Home also operates a pediatric convalescent center for children who are dependent on technology to sustain life, as well as children who are terminally ill.
RecycloCraftz is the newest organization I have become involved with, but certainly dear to my heart. This organization helps families in Zambia buy teaching them how to make items from recycled materials and the items are then exported to be sold in the US. I have hosted and assisted with a home party where women can browse and purchase some of the handmade items. I will be volunteering with RecycloCraftz at an art fair next Saturday. cardboard boxes, seeds, audio and video tape, wire, damaged fabric & fabric scraps, plastic grocery bags, & wood. Each item then has a tag attached with a picture of the person who made it and a little information about them. Through this organization, these women are able to provide support for their families from the sales of their items. The average wage of the women in this area is between 30 and 60 cents a day and that is for heavy manual labor, like crushing rocks! You can imagine how having this oportunity to work with RecycloCraftz has changed these women’s lives. RecycloCraftz seeks to make an educational, economic and eternal difference in the lives of impoverished, widowed, unemployed and orphaned women, men and youth and children in Zambia through vocational training, teaching and empowering. Ok, so as the title indicates, my name is Elizabeth Verona Frame, but most people call me Beth. I live in Louisville, KY with my husband, Scott and our dog, Roxie! I’m originally from the Louisville area, but went to Murray State University (in Western Kentucky), then participated in National Student Exchange my sophomore year and attended Hunter College in NYC and completed my internship at UBS Financial in NYC. After college I had the opportunity to become a bank examiner for the US Treasury Department Office of the Comptroller of the Currency and moved to Charleston, WV. I met my husband in Charleston and after several years the travel required as a bank examiner became very challenging. It was a difficult decision to leave the OCC, but I had a wonderful opportunity to transition to community banking by working at a bank in Charleston until about a year and a half ago when I had the chance to come back to my home state to work at a bank in Louisville. I don’t think I realized how great Louisville was as a kid, but my husband and I have had a great time exploring the city so far! I also took a cupcake decorating class at a local craft store and have tried my hand at a few cakes based on what I learned. It’s all fun, but don’t worry…I plan to keep my day job-haha! If you are the owner of Elizabeth Verona Frame, or someone who enjoys this blog why not upgrade it to a Featured Listing or Permanent Listing?